Use of natural health products, including herbal medicines, vitamins, and supplements, is widespread.1 With expanding use, clinicians and researchers are focusing their attention on the possibility that these products interact with prescribed drugs and alter their metabolism. Case reports and clinical trials have found that St John's wort (Hypericum perforatum), in particular, may cause important interactions, possibly leading to adverse events or drug resistance. The purposes of this systematic review were to identify all clinical trials examining drug interactions of St John's wort, assess these trials' methodological quality, and summarise their findings. We searched the following databases (from inception to April 2004): AMED, CINAHL, E-Psyche, CISCOM (to December 2002), Cochrane CENTRAL, Medline, the National Research Register (United Kingdom), ClinicalTrials.gov (United States), and bibliographies of retrieved articles; we also contacted experts in the field. Two reviewers (EM, PW), working independently and in duplicate, identified relevant abstracts and assessed eligibility after reading the full reports, resolving disagreements by consensus or arbitration. Eligible studies were prospective clinical trials examining the pharmacokinetic effect of St John's wort on the metabolism of a conventional drug. We assessed the quality of each study by examining the study design, the mechanism to allocate patients, the inclusion of control patients, the use of placebo, and justification of sample size. In addition, we determined whether the trial used single dose pharmacokinetics or studied St John's wort at its steady state (continuous use of the herb increases the likelihood of an interaction). We also determined if the investigators assayed St John's wort in each preparation. We measured inter-rater agreement (adjusted for chance) for eligibility using the κ statistic. We describe the magnitude of the interaction between St John's wort and the conventional drug by differences in the area under the curve (AUC) of the drug before and after challenge with St John's wort. We used the difference in AUC reported as a percentage of the AUC at baseline and 95% confidence interval around this change; if the difference was not reported, we estimated the confidence interval from reported measures of variance or P values for the change in AUC.2 We considered an interaction to be important when the confidence interval of the AUC difference was completely outside of the standard deviation (SD) 20% equivalence limits; we considered that no important interaction existed when the confidence interval of the AUC difference was entirely within the SD 20% equivalence limits.3 Owing to statistical and methodological heterogeneity we did not pool results of the separate trials. The chance adjusted inter-rater agreement for inclusion of studies was κ = 0.8 (95% confidence interval 0.6 to 1.0); the 22 included trials (published between 1999 and April 2004) studied an average of 12 (SD 5) participants.4–25 (For more details of selection and of the included studies, see the flow chart and table on bmj.com) Five studies enrolled patients who needed the drugs for health reasons4–8; all others enrolled healthy volunteers. Two studies investigated both single dose and steady state pharmacokinetics,9 10 and 18 studies examined steady state pharmacokinetics. Two studies examined exclusively urine metabolites.11 12 The mean duration of St John's wort dosing for steady state studies was 17 (SD 11.5, range 3-56) days. In seven studies, participants received St John's wort concurrently with the conventional drug for the post-exposure AUC assay.4–6 13–16 Fifteen trials reported independent assays of the St John's wort preparation to determine whether the dosage of interest was truly contained in the product. Investigators assayed the serum concentration of the conventional drug for a mean of 37.5 (SD 47, range 7-216) hours to generate a “concentration over time” curve and the AUC. Our review shows that St John's wort has the potential to reduce systemic bioavailability of many conventional drugs. However, the studies had several shortcomings. 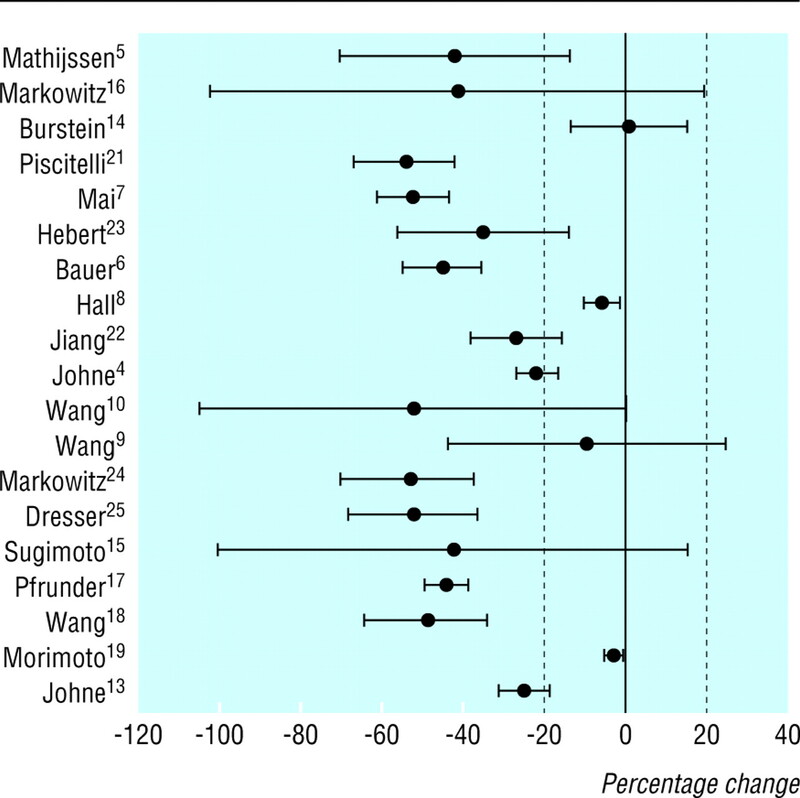 Firstly, they were small: in 10 of the 22 trials the 95% confidence interval overlapped the 20% threshold for an important reduction in the area under the curve (AUC), so the results were inconclusive, and no study was large enough to examine subgroups meaningfully. Secondly, they contained few safeguards against bias (such as random and concealed allocation of participants, inclusion of controls, and blinding. Thirdly, their methods varied widely, with inadequate use of widely accepted standards of research practice. The variable effect of St John's wort on different conventional drugs may be related to the variety of metabolic pathways that these drugs use. We could not, however, discern a clear relation between the nature of the conventional drug being tested or its posited metabolism and the magnitude of the interaction. Our review uncovers several threats to the validity of pharmacokinetic studies that examine herb-drug interactions. A serious concern about conducting any research with herbs is the correspondence of the herb studied with the products that are available to and preferred by consumers. Assaying the herb is critical, as the product's content can differ from the dosage reported on the label and the composition varies from batch to batch.29 Only 15 of the 22 studies reported that they assayed the St John's wort content of the preparations they used. Furthermore, the duration of dosing used in these trials was highly variable, and few studies reported their rationale for the dosing regimen tested. The methodological quality of the included studies was limited. Most studies used a “before and after” design that lacked contemporary controls or randomisation of order of administration, in particular to control for carryover effects, time dependent metabolic variability, and co-ingestions. When investigators used controls, they did not clearly describe how they allocated participants, how they generated the allocation sequence, and how they concealed this sequence from investigators enrolling participants. The US Food and Drug Administration's guidance on conducting pharmacokinetic trials,3 a commonly used guide, may consider these important safeguards against bias in future recommendations. We used a somewhat arbitrary threshold (20%) in AUC change to identify important changes in systemic bioavailability of the conventional drug after exposure to St John's wort; we could not identify clearly established drug specific thresholds beyond which reductions in AUC might lead to important reductions in drug effect. Lack of such thresholds may seriously hinder the clinical interpretation of pharmacokinetic trials. Clinicians and patients should beware of possible reductions in systemic bioavailability of conventional drugs when taken concomitantly with St John's wort. Higher quality research is necessary to provide reliable information to guide clinical practice. In particular, trials that include adjustments in the dose of the conventional drug to achieve optimal AUC in the presence of herbs that reduce bioavailability of that drug may provide clinicians and patients with an approach to their concomitant use. .Use and expenditure on complementary medicine in England: a population based survey.Complement Ther Med2001; 9:2–11. .Means and their differences. In: Altman DG, Bryant TN, Gardner MJ, eds. Statistics with confidence.Bristol:BMJ Publishing,2000:28–35. .Decreased plasma levels of amitriptyline and its metabolites on comedication with an extract from St John's wort (Hypericum perforatum).J Clin Psychopharmacol2002; 22:46–54. .Effects of St John's wort on irinotecan metabolism.J Natl Cancer Inst2002; 94:1247–9. .Alterations in cyclosporin A pharmacokinetics and metabolism during treatment with St John's wort in renal transplant patients.Br J Clin Pharmacol2003; 55:203–11. .Impact of St John's wort treatment on the pharmacokinetics of tacrolimus and mycophenolic acid in renal transplant patients.Nephrol Dial Transplant2003; 18:819–22. .The interaction between St John's wort and an oral contraceptive.Clin Pharmacol Ther2003; 74:525–35. .Effect of St John's wort on the pharmacokinetics of fexofenadine.Clin Pharmacol Ther2002; 71:414–20. .The effects of St John's wort (Hypericum perforatum) on human cytochrome P450 activity.Clin Pharmacol Ther2001; 70:317–26. .St John's wort: effect on CYP2D6 activity using dextromethorphan-dextrorphan ratios.J Clin Psychopharmacol2001; 21:530–2. .Effect of St John's wort on the activities of CYP1A2, CYP3A4, CYP2D6, N-acetyltransferase 2, and xanthine oxidase in healthy males and females.Br J Clin Pharmacol2004; 57:495–9. .Pharmacokinetic interaction of digoxin with an herbal extract from St John's wort (Hypericum perforatum).Clin Pharmacol Ther1999; 66:338–45. .Lack of effect of St John's wort on carbamazepine pharmacokinetics in healthy volunteers.Clin Pharmacol Ther2000; 68:605–12. .Different effects of St John's wort on the pharmacokinetics of simvastatin and pravastatin.Clin Pharmacol Ther2001; 70:518–24. .Effect of St John's wort (Hypericum perforatum) on cytochrome P-450 2D6 and 3A4 activity in healthy volunteers.Life Sci2000; 66:PL133–9. .Interaction of St John's wort with low-dose oral contraceptive therapy: a randomized controlled trial.Br J Clin Pharmacol2003; 56:683–90. .Effect of St John's wort on the pharmacokinetics of theophylline in healthy volunteers.J Clin Pharmacol2004; 44:95–101. .St John's wort induces intestinal P-glycoprotein/MDR1 and intestinal and hepatic CYP3A4.Clin Pharmacol Ther2000; 68:598–604. .Indinavir concentrations and St John's wort.Lancet2000; 355:547–8. .Effect of St John's wort and ginseng on the pharmacokinetics and pharmacodynamics of warfarin in healthy subjects.Br J Clin Pharmacol2004:57:592–9. .Effects of St John's wort (Hypericum perforatum) on tacrolimus pharmacokinetics in healthy volunteers.J Clin Pharmacol2004; 44:89–94. .Effect of St John's wort on drug metabolism by induction of cytochrome P450 3A4 enzyme.JAMA2003; 290:1500–4. .Coordinate induction of both cytochrome P4503A and MDR1 by St John's wort in healthy subjects.Clin Pharmacol Ther2003; 73:41–50. .St John's wort: a systematic review of adverse effects and drug interactions for the consultation psychiatrist.Psychosomatics2003; 44:271–82. .The emerging recognition of herb-drug interactions with a focus on St John's wort (Hypericum perforatum).Psychopharmacol Bull2001; 35:53–64. .St John's wort (Hypericum perforatum): drug interactions and clinical outcomes.Br J Clin Pharmacol2002; 54:349–56. .Analysis of the hypericin and pseudohypericin content of commercially available St John's wort preparations.Can J Clin Pharmacol2003; 10:114–8.